You know how when you buy a particular marque or model of car you start to see them everywhere? 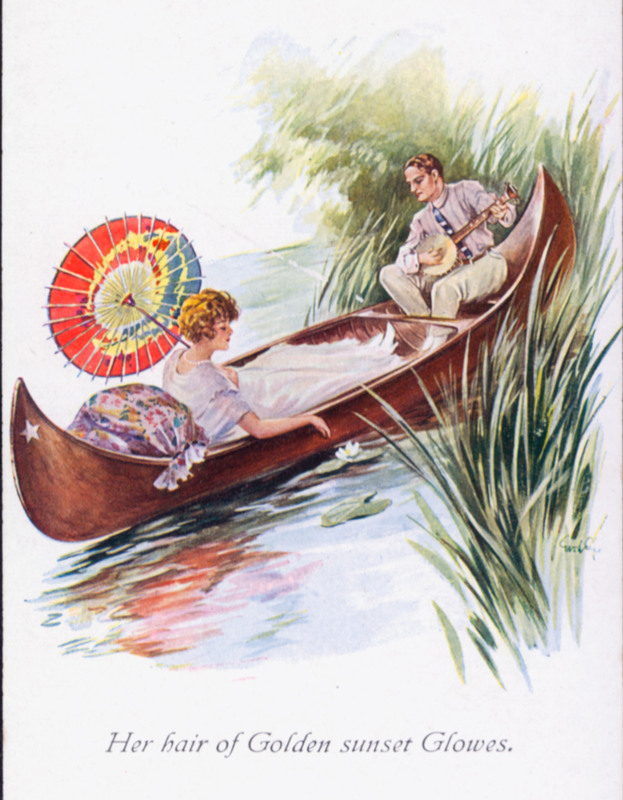 A few years ago, wandering through ebay while avoiding a more important task, I came across some images of canoeing on romantic themes. I can’t recall now which one I saw first, but here’s a representative example. How charming, I thought. They’re courting in a canoe. I bought the first one I saw, and then I bought a few more, and soon the search expanded to sheet music and souvenirs too. 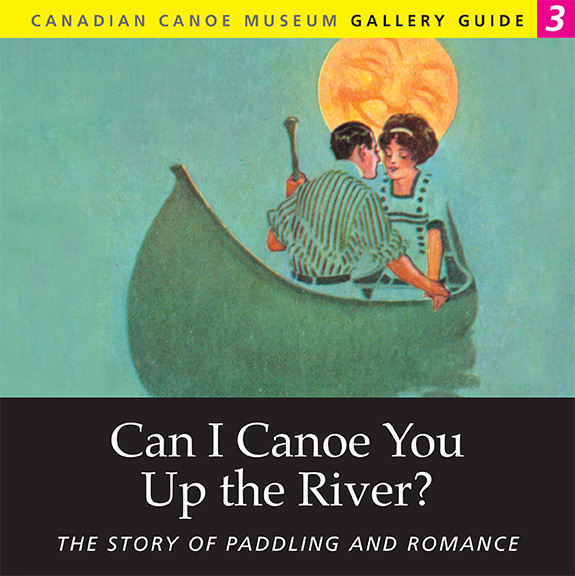 Last year, while I was still working at the Canadian Canoe Museum in Peterborough, Ontario, I proposed the idea of an exhibit about canoes and romance. Because I left the museum for another job at the end of the year, I didn’t end up curating that show, though I did do a design concept for it. I did agree to write the Gallery Guide for the exhibit, however. These Gallery Guides are a project that I started at the Museum three years ago. The original idea was to publish some of the material that inevitably doesn’t make it into the finished exhibit and provide visitors with some more information that they can take home. The first Gallery Guide was about the Museum’s “It Wasn’t All Work” gallery and explored the topic of canoeing for pleasure. The next Guide in the series was published in 2013 and recounted the story of the Museum’s founding and its origin in the private canoe collection of Kirk Wipper. The third Gallery Guide, I’m proud to say, is my own. It was released when the exhibit it accompanies was opened on Wednesday, April 23rd. The collecting of the images and souvenirs was great fun (and continues to this day), and the writing was a lot of hard work, but it’s a great exhibit and I encourage you to drop in if you’re travelling through southern Ontario. It’s open now and will be up until next March. You can purchase a a copy from the Canadian Canoe Museum Store. The first (It Wasn’t All Work: Canoeing for Pleasure) and second (Becoming Kirk Wipper: The Story of the Museum’s Founder) Gallery Guides are also available from the store online. 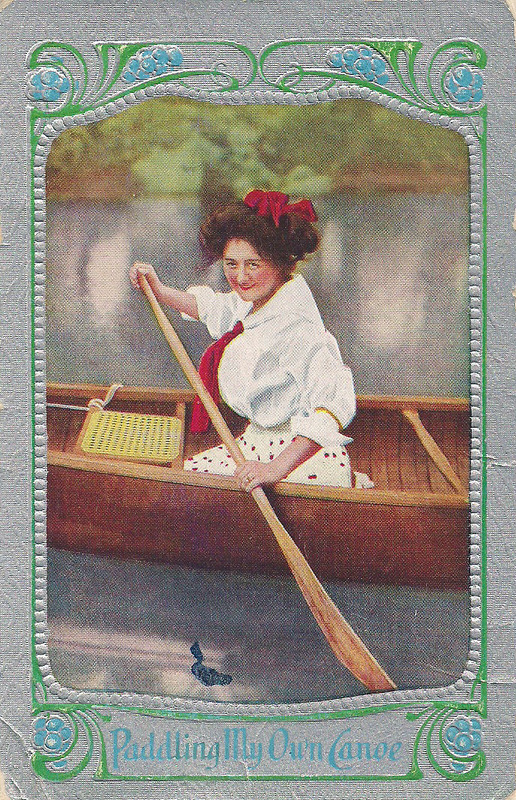 A little late for Mother’s Day (we’re clearly running on Cultural Standard Time here at Playing With Boats, which is always a bit behind real-world time), here are some images of women in canoes from my collection, all from around the turn of the last century. Entitled “Landing,” this card shows our friend alighting from a handsome little lapstrake cruising canoe. Some time later, in the same canoe, with the same lacy shawl (or a gill-net, but somehow I think it’s a shawl. . .) but with a different outfit (but a no less fluffy hat), she bids “Goodbye.” We can only speculate about what’s happened in between these two cards. Judging from how straight the post is, I’d say we’re looking at the stern of the canoe here. 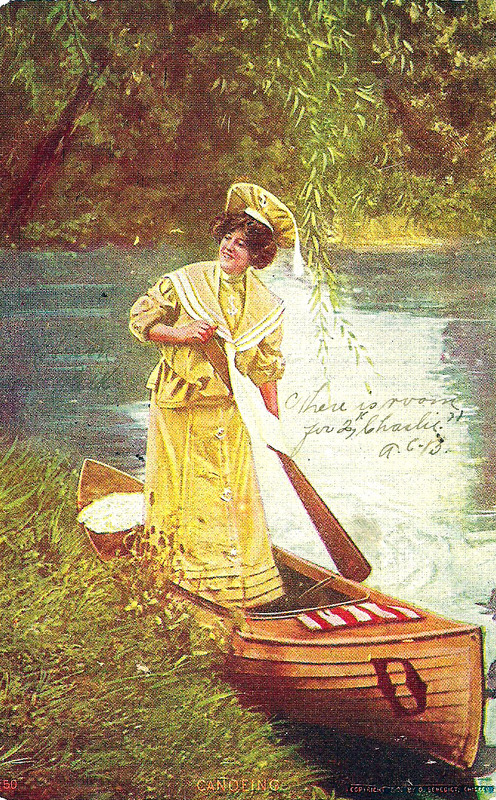 Scenes suggestive of shoreside trysts notwithstanding, the theme of womens’ independence shows up often in these postcards–we might call it the “canoe of one’s own” motif. 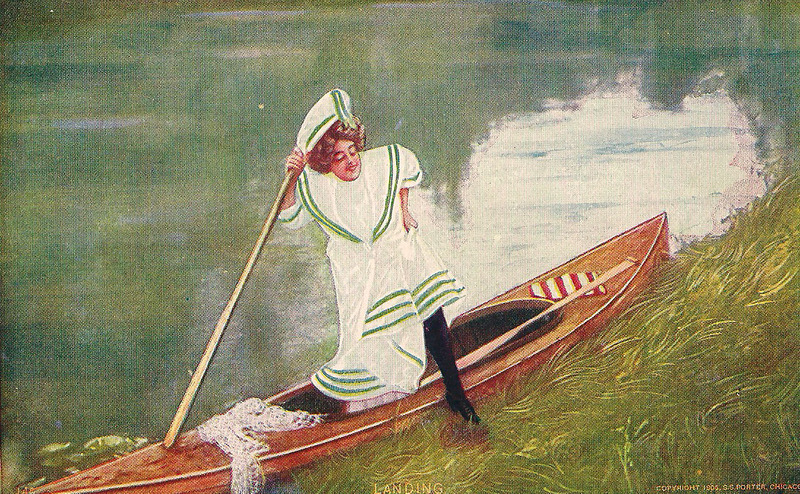 In a sporty sailor suit, charmingly encircled with two lines of rope and with a decorative background of paddles, our subject is clearly enjoying being out for a paddle. 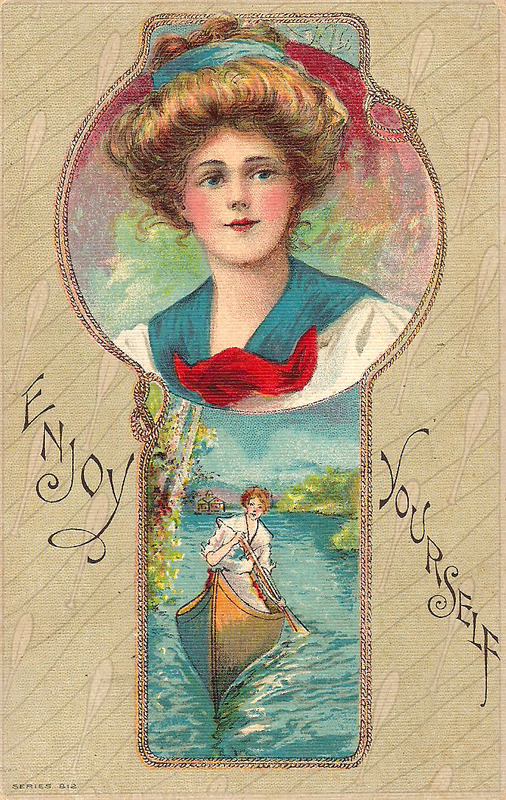 As she’s out on her own doing a sports activity, a pleasure all-too-rarely afforded women of her era, perhaps the most important word is “yourself.” She certainly seems to be firmly in control of her canoe. 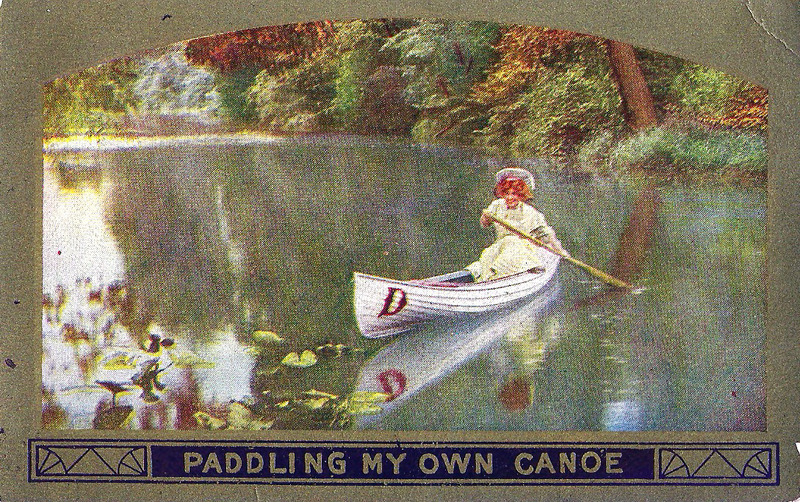 “Paddling my own canoe” is another motif that shows up frequently in popular culture images of canoing. 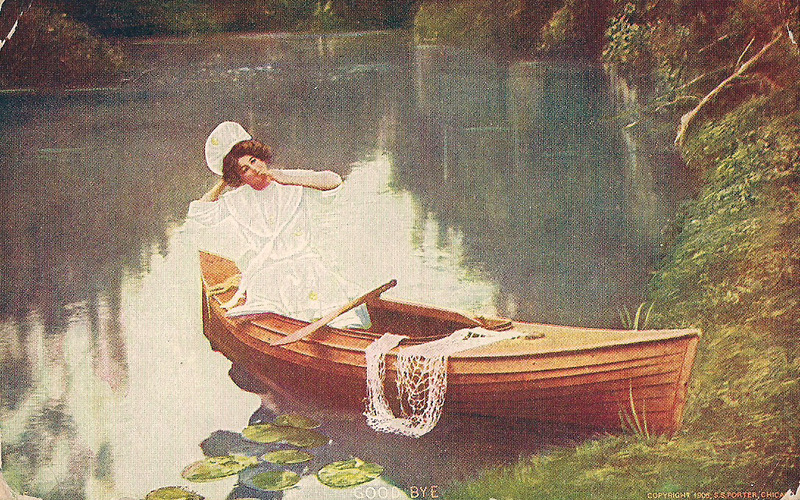 I wouldn’t say she looks altogether comfortable, and there’s at least a chance that she’s holding an oar and not a paddle, but the point remains that women like her can and did paddle their own canoes at the turn of the last century. The more of these cards you look at, the more interesting they get. Here we have several elements from other images, including the same initial “D” painted on the bow as above, albeit on a bright-finished canoe. The red and white striped fabric and the shawl lying on the deck sure look a lot like those in the first image, and come to think of it, her dress and hat are also pretty similar. That’s a pretty wide-shafted paddle she’s holding, too. 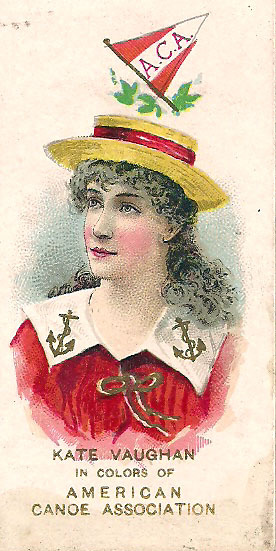 OK, strictly speaking Kate Vaughan isn’t in a canoe, but she is wearing the colours of the American Canoe Association in this 1890s card from the Duke Tobacco Company, part of their “Yacht Colors of the World” series. Kate Vaughan (1852-1903) was a well-known English actress and music-hall performer. 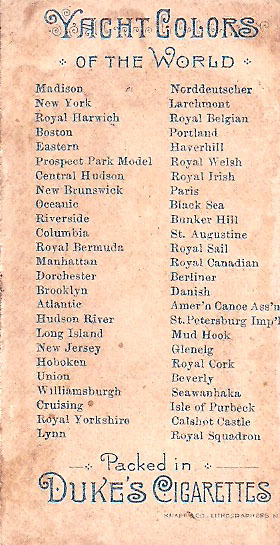 While you’re reading the impressive list of yacht clubs on the back of the card, take a moment to enjoy the exquisite typography of the titles at the top and bottom. There’s a font that’s worth reconstructing. Until next time, when we might have done enough work on it to get back to our sailing canoe design. . .